Ray Hutton, a stage actor and understudy in Man of La Manche. Stop the star of the show from falling down the stairs and breaking his leg. I like the two scenes where Sam is talking to Al offstage: first when he initially sees Nicole and second when Al discovers that they spent the night together. Bakula does a great job of being vulnerable and lost in love, and the music from the play adds to the scenes. Who knew theater people were so devious! Michelle in particular is just awful for messing with Sam and Nicole like that, and John isn't any better. This is the latest leap so far -- the previous latest one was 1976 (Disco Inferno). Tremendous performance by John Cullum -- I'd reckon to say it's the best effort by a guest star thus far in the series. He holds a special place in my Mom's heart as the star of her favorite play, Shenandoah. In fact, we went to see Scott Bakula play the same role (Charlie Anderson) when Shenandoah came to Ford's Theatre. If Al is a hologram and can't touch anything, how is he able to appear to walk on the ground at the exact same level as everyone else? Given all that Sam has been through and done for God (or whoever is leaping him around), it sure was nice for God to thrown Sam a bone in the form of living out his childhood fantasy by spending the night with his former piano teacher. Fun fact: the actor who plays Manny was the voice of Pumbaa in The Lion King. This is my new #1 episode. Great characters, acting, plot, music, and it's also fun and poignant at the same time. The plot line with Sam meeting his childhood crush as an adult is creative and also adds to the tragic hero element of the Sam Beckett character, especially against the backdrop of Don Quixote and "The Impossible Dream." This episode is fun. And that's legit Scott singing, which is always preferable to bad voicematch + lip syncing. I'm not sure how I feel about Sam wanting to hook up w/ his piano teacher, but beyond that, I really like this one. Yeah he's got a good voice. He does. He sang "My Favorite Things" at the Macy's Thanksgiving Day parade one year back when QL was still on... I think that's the song he did. It's been a long time, so now I'm not sure if I'm remembering right. This episode was decently entertaining for me but I certainly didn't like it as much as you. The same thing that bugged me about the second episode of the series bugged me here too.....that Sam is leaping randomly through time yet stumbles into situations where he arbitrarily encounters former girlfriends despite the fact that he's not supposed to change his history with them specifically. C'mon...the world just isn't that small. On the other hand, it was kind of fun that in this case it was a former adult piano teacher who was out of reach to him as a boy but no longer. I got a modest kick out of the soap opera antics of the theater crew deviously pitting the cast against each other. Janine Turner's character Michelle was definitely a little hussy. The actor who played Manny is best known to me as Mr. Twinkisetti from "Perfect Strangers", far and away my favorite TGIF show which ran from 1986-1993. Agreed that Sam's singing was pretty good and hopefully they'll take advantage of this in future episodes. The episode was directed by showrunner Donald Bellisario....didn't realize he did directing. I'd put this one about on par with "So Help Me God", but perhaps a tick behind it, in the middle of the pack, but not even on the same planet as "Jimmy" for the magnitude of the storytelling for me. I think it's cool when he leaps into situations related to his and Al's personal lives, and I wouldn't have minded seeing it even more. And it makes sense to me that that would happen since his leaps aren't totally random given that it's being controlled by God or a God-like mystical force who is showing some discrete decision making power. This is one of my all-time favorite episodes! Man of La Mancha is the perfect play for Sam to leap into. 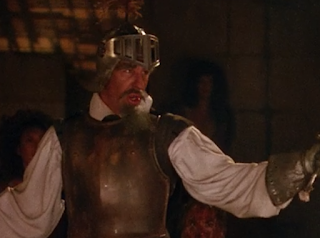 I love Man of La Mancha and John Cullum. I originally saw John Cullum on Broadway in “Shenandoah,” that takes play during the Civil War. I sang the songs and played the music so much that Nick’s sisters knew all the words. I have said, and I hope my children remember, that if Shenandoah is ever on Broadway again, I am going…even if someone has to ‘prop me up.” So, then “Shenandoah,” comes to Washington D. C. at the Ford’s Theater and Scott Bakula is the main lead, John Cullum’s part on Broadway. Perfect setting for a Civil War play! I was in heaven. • Ernie Sabella, who played Sancho, is the voice of Pumba in the Lion King. • Paul Sands, who played the Stage Manager, has played supporting roles on many TV shows, such as Mary Tyler Moore, Laverne and Shirley, The Love Boat, St. Elsewhere, and Night Court. The list is long. Learned Something New: I did not know what a “Dry Beer” was. Sam orders it at the cast party. It is a beer that is brewed to have a higher alcohol content and to have a less sweet and less bitter after taste. Al is seen and heard by the drunk John Cullum. So Sam can be seen by animals, children, and drunken actors. Best part: When Sam is leaping and Al and he are saying lines from the play. Al is Sam’s Sancho and Sam is off to fight more windmills. Beautiful!